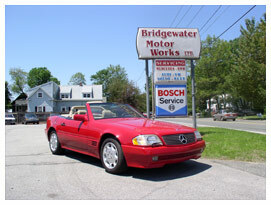 Jim has been working with Bridgewater Motor Works since 2002, arriving with an impressive list of credentials and hands on experience. Having earned a two year degree for automotive repair at Blue Hills Regional, his career experience began working with several car dealerships: Hyundai, Ford, and Dodge. But what Jim truly enjoys is working on European cars and has taken full advantage of all of the training opportunities afforded to him. He is an ASE certified master technician and is not intimidated by any tough diagnostic problem. Beyond that, Jim has access to both the factory literature and diagnostic tools, but is not afraid to lean on the boss (Al) for any tough problem. Personally, Jim is very family oriented and spends most of his time with Julie and his son James. As a hockey dad, he gets to spend at lot of time at the rink. Jim also enjoys playing hockey when he can, watching the Boston Bruins, and has recently discovered salt water fishing. Jim is looking forward to the birth of his second son in 2012.